Five years ago, the Boston Beer Company revived their late, lamented Longshot competition. The competition, which had been held a couple of times in the late 90s, allows homebrewers to submit their best recipes to the Boston Beer Company with the hope of having their homebrewed creations scaled up to production level under the Sam Adams banner. There’s really no downside to this marketing concept. It allows Sam Adams to brew up some more “experimental” offerings. It gets homebrewers and Aleheads (and homebrewing Aleheads) excited about the Sam Adams brand. And it helps promote the craftsmanship and artistry that is inherent in homebrewing…an avocation pursued by both noble and common man throughout human history. Last year’s contest (which produced this year’s winners) was a little different than Longshot competitions in the past. The 2010 Longshot campaign asked homebrewers to send in beers that would only fit in Category 23 of the BJCP (Beer Judge Certification Program’s) Guidelines. The BJCP Guidelines have 22 broad categories like “Porter” and “India Pale Ale” which are then broken down into sub-categories (IPA has three…American IPA, English IPA, and Imperial IPA). While those 22 categories cover most of the bases, there are always iconoclasts that don’t fit neatly into any of those pigeonholes. That’s where Category 23, “Specialty Beers”, comes in. It’s a catch-all category for all of those unconvential beers that can’t find a home in the other categories. Honey B’s Lavender Ale: The Honey B was brewed by Caitlin DeClercq, a Sam Adams employee. Since the Longshot promotion was revived in 2006, one winner has always been an employee of the Boston Beer Company. I happen to think this is brilliant. It encourages the company’s employees to get interested in homebrewing and it helps promote loyalty in the brand from within. Unfortunately, I can honestly say (with no intentional malice) that for the past five years, the worst beer in each Longshot sixpack has been the one produced by a Sam Adams employee. This could just be coincidence, but it’s more likely because the other Longshot winners are highly seasoned homebrewers competing against thousands of other homebrewers while the Sam Adams employees assumedly have FAR less experience and are competing against substantially fewer folks. Also, for whatever reason, the Sam Adams employees seem obsessed with gimmicky adjuncts. In ’06, the employee beer was Boysenberry Wheat…in ’07 it was Grape Ale…in ’08 it was Cranberry Wit…in ’09 it was Lemon Pepper Saison. And this year, it’s Honey B’s Lavender Ale. It’s like the Sam Adams employees seek inspiration from their fruit bowls and spice racks. The Honey B is brewed with honey and lavender as you might expect from the name. And while those flavors aren’t cloying, they’re also not particularly pleasant. The Honey B looks and drinks like a fairly uninspired, very pale ale that has been “spiced up” by dumping table sugar and soap into the beer. The aroma is bread soaked in perfume and the flavor is somehow both drab AND confusing. I guess what I’m saying is, I did not like this beer. And I did not finish this beer. 1 Hop. Friar Hop Ale: Richard Roper’s Friar Hop Ale is some amalgamation of an American IPA and a Belgian Strong Pale Ale that doesn’t seem to cross the line into Belgian IPA territory. Frankly, it kind of fails at both styles. It has neither the compelling citrus or piney hop bitterness you get from a good American IPA nor does it have the funky yeast flavors and banana esters you generally get from a good Belgian brew. It’s certainly not terrible…it just tastes like a dumbed-down Belgian with a smattering of American hops thrown in to shake it up enough to fit into Category 23 status. It’s very sweet with loads of Belgian spices (which almost feel tacked on…not organic) and has a slightly syrupy mouthfeel. It’s a good-looking beer though….beautiful amber color and nice, thick white head. 2 Hops. Blackened Hops: Rodney Kibzey is the rock star of the Longshot competition…having won in 2007 with his Weizenbock and again last year with his Blackened Hops. The Blackened Hops would clearly fit into the American Black Ale category (or Black IPA…or Cascadian Dark Ale…whichever your preference), just as soon as the BJCP gets around to adding that subset to the American Ale category (right now, it just consists of American Pale Ale, American Amber Ale, and American Brown Ale…come on BJCP!). I, for one, love this style of brew. All of the dark, roasted malt of a good porter with the huge hop aroma and bitterness of an American IPA. The style seems to be getting more and more popular and I’ve recently enjoyed a number of American Black Ale offerings from a variety of ale factories. Kibzey’s version is an excellent example of the style. It’s not hugely complex or overpowering…just a clean, easy-drinking session brew that perfectly balances a nice, crisp, citrus hop profile with a sturdy, well-roasted malt backbone. Medium-bodied with a lingering head and pretty lacing, this is far and away the best brew in the package. 3 Hops. 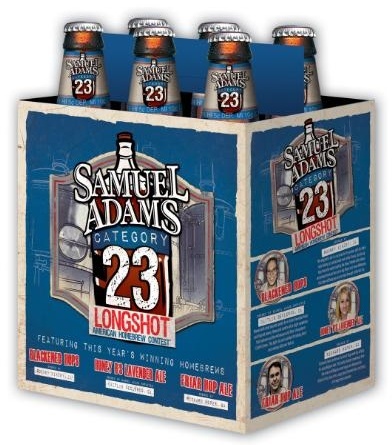 They can’t all be winners, but I still love the Longshot series and I will continue to buy a sixpack every year Sam Adams brews them up. Congrats to the winners and good luck to all of the homebrewers submitting their creations in the 2011 competition! Posted in Tasting Notes.Tagged Blackened Hops, Boston Beer Company, Category 23, Friar Hop Ale, Honey B's Lavendar Ale, Longshot, Sam Adams. A thoroughly underwhelming lineup, and a great concept that doesn’t seem to quite work out in the end. Previous Post SAY HELLO TO SALTY NUT!